You've seen our first photos of the 2012 BMW M5 (aka BMW Concept M5) and read our first drive, so what's left? Official photos and the details of the concept gleaned from the press release. Debuting at the Shanghai Auto Show this week, the newest M5 is as close to a production car as any "concept" vehicle can be. 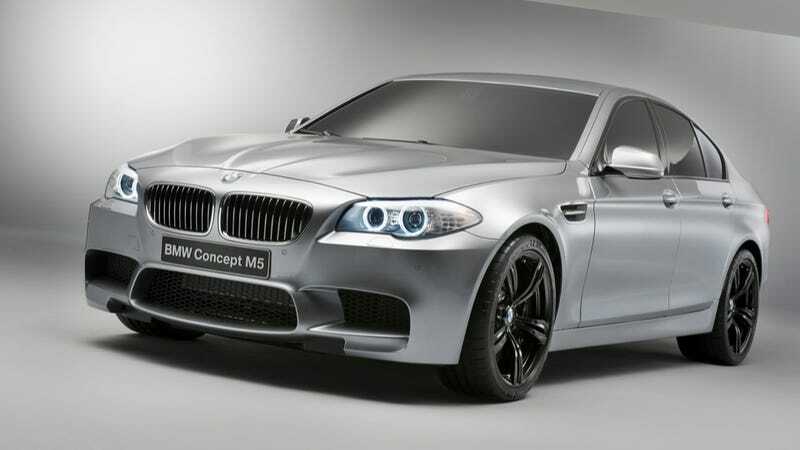 Given that, with the possible exception of the black wheels, this is what we expect the new M5 is going too look like. This includes the now-mandatory giant intakes up front backed by a black mesh grille, flared wheel arches, and those double-spoke 20-inch forged M light alloy rims in a dark black. The standard M-type vent on the front side panel's also there, with a thick chrome element. Finally, out back, there's the prominent diffuser and twin dual-exhausts, hinting at the power contained underneath the V-shaped indent in the hood. BMW's official language calls the engine in the new M5 a "V8 with M TwinPower Turbo," which BMW has previously used in the BMW X5 M.
In other M vehicles, the 4.4-liter TwinPower Turbo unit benefits from two lag-fighting twin-scroll turbochargers putting out approximately 555 horsepower. Now underhood in a vehicle not used to cart drugs across the border or kids to clarinet lessons, estimates for the new M5 say closer to 578 horsepower and 530 lb-ft of torque. Emissions will also be down by 25%, something most M5 owners will surely care deeply about. Getting the power down is a seven-speed M double-clutch transmission and an Active M Differential, which was tested on M roads by M drivers in an active M driving session during the last M years. Given the Bangle-ized last generation E60 M5 was the best selling version ever — despite a chorus of E39 M5 enthusiasts treating it like the Meh5 — this newest M5 doesn't need to do much to continue to move inventory. And an U.S.-only manual version could get the purists to shut their M mouths for a bit.